Karachi (August 20, 2018): Federal Finance Minister Asad Umar has said that incompetent and corrupt management will be replaced and people’s money will be spent on people. 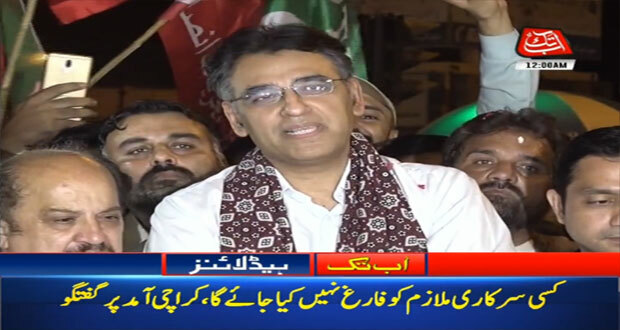 While talking to journalists on his arrival at Jinnah International Airport, Asad Umar said that ‘Naya Pakistan’ interlinked with ‘Naya Karachi’. A large number of PTI activists gave warm welcome to Asad Umar on his arrival at Karachi from Islamabad and showered rose petals. The finance minister said that they will create new jobs to boost the economy. He said that they will not replace governor State Bank and added that PTI’s government will strengthen institutions. 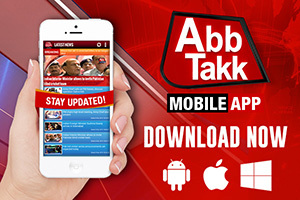 Asad Umar said that they will develop the country in collaboration with the masses. Earlier, on Monday, the prime minister held his first official meeting with his recently sworn-in ministers where they were served only tea without biscuits or any other refreshments, an indication that the cricketer-turned-politician is determined to keep a tight check on the cabinet’s expenses as well. According to sources, members of Imran’s cabinet rose from their seats to welcome him to the meeting on Monday. Khan congratulated the cabinet members for taking oath of their respective offices. According to sources, the prime minister tasked his cabinet to work 14 hours a day, telling them that he will himself work for more than 16 hours. He directed the cabinet members not to waste tax payers’ money, adding that they will have to cut down expenses. Khan said the cabinet would meet once or more in a week, despite the fact that he wished to summon the meeting everyday, the sources said further. Speaking further to the members, he said he would not have allowed them holidays, had there not been Eid vacation announced, according to sources. The prime minister told the ministers that they were part of his cabinet and they would all have to forget their families. 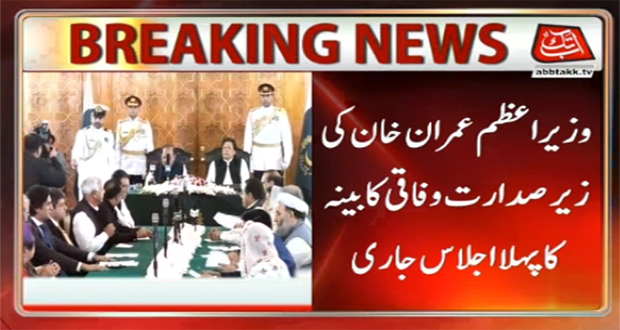 On Monday, the swearing-in ceremony for Prime Minister Imran Khan’s new 16 members federal cabinet held at the President House . 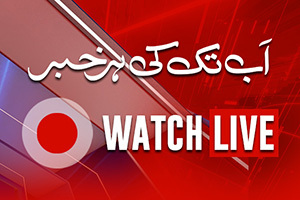 President Mamnoon Hussain administered the oath to the cabinet members. The ceremony was attended by the prime minister, along with other dignitaries.